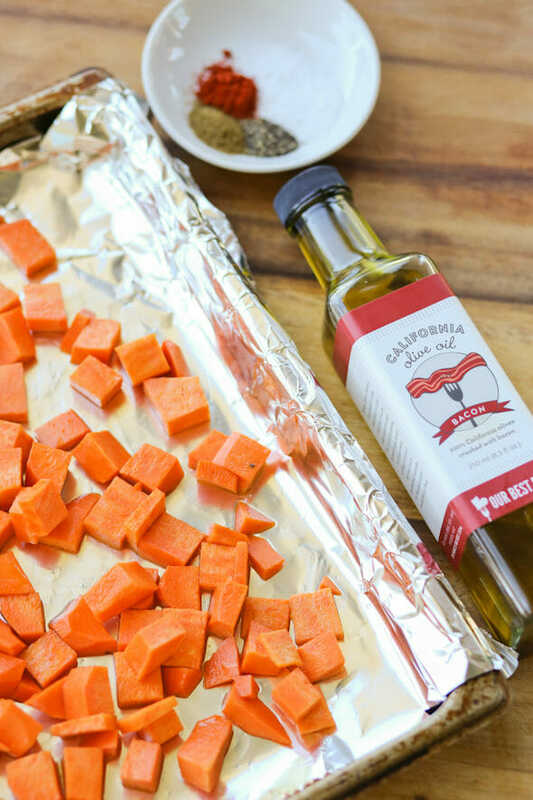 If you’ve never put roasted sweet potatoes into a salad before, you’ve got to try it. Lately I’ve been roasting a bunch like this and keeping them in the fridge to toss onto salads, and even in egg scrambles in the morning. You can use them in this recipe warm from the oven, cooled to room temp, or chilled. My favorite way to cook them is to dice them into small pieces (like 1/2 inch or less) and toss them in Bacon Olive Oil and a spice mix of smoked paprika, ground cumin, kosher salt, and black pepper. When they come out of the oven they should be nice and toasty brown on some of the edges; I actually kind of like a few semi-burned, but I’m weird like that. I love the overcooked crispy brown french fries at the bottom of the container, too. For the salad, use the quantities you like, either for one or for a crowd. 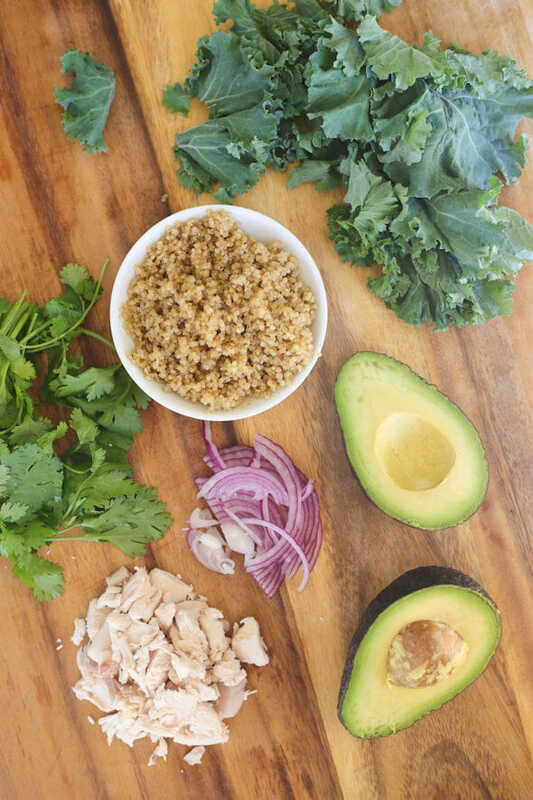 Kale or spinach, cooked and cooled quinoa, cilantro, sliced red onion, avocado, and diced chicken. Pile everything in there. You’ll see it’s got almost every food group represented and an awesome combination of varying flavors and textures. It’s definitely a one-dish dinner and a salad that won’t leave you starving an hour later. There are a few dressing options that I like. 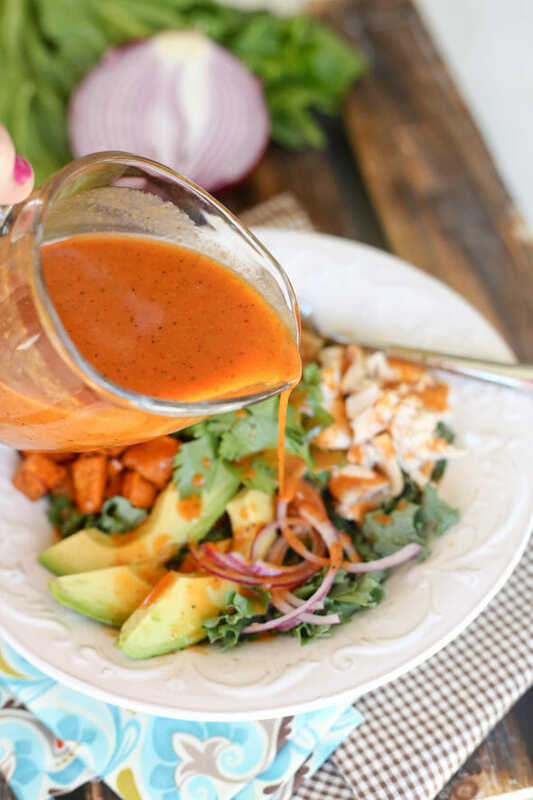 I’ve been eating this non-stop lately with our Smoked Paprika Vinaigrette, but it’s also awesome with this Maple Bacon Vinaigrette, or this Lime-Cilantro Vinaigrette. 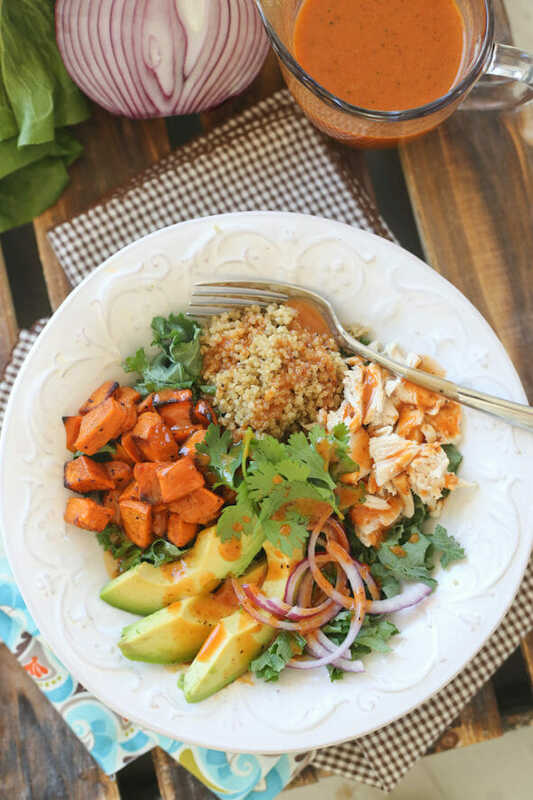 There are quite a few components, but if you keep them stocked in your fridge (some cooked quinoa, chicken that’s already chopped and ready, sweet potatoes that are done) it’s easy to throw together and eat for lunch or dinner a few days in a row. A delightful combination of sweet, savory, tangy and smoky ingredients. Makes a great lunch or dinner main dish salad. Fill large salad bowl or individual serving with spinach or kale. Layer remaining ingredients on top and dress with salad dressing. *Add more flavor to your quinoa by cooking it in broth instead of water. Preheat oven to 400 degrees. 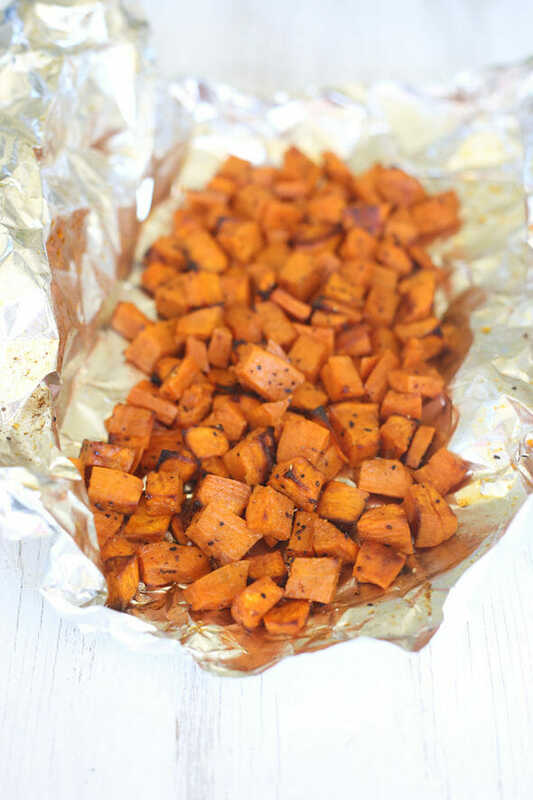 Toss sweet potato chunks in oil and then toss with spices. Spread on a baking sheet and cook for about 20 minutes or until browning on edges. This is so yummy! 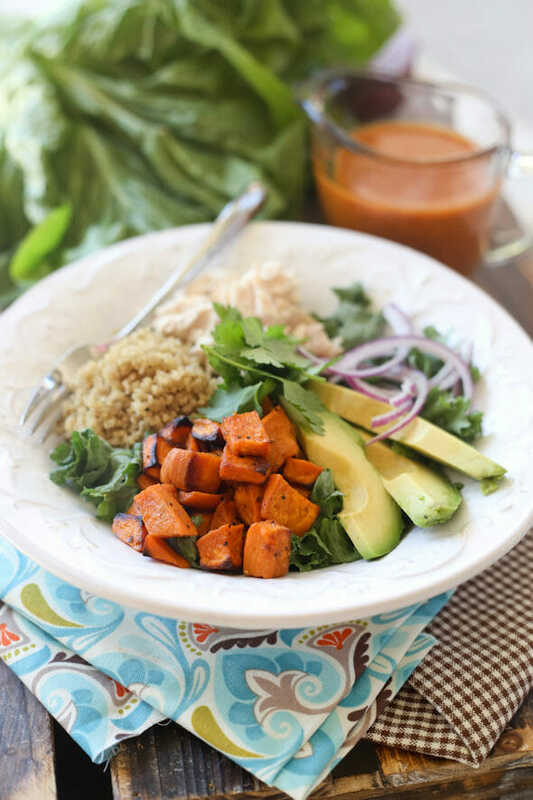 One night I was starving and grabbed leftovers from the fridge – ended up with sweet potatoes, chicken, and Quinoa – mixed it all together and it was sooo good! Need to try it with dressing! This salad looks amazing! I’m definitely pinning this so I remember to put it on our menu plan next week! This is one of my all-time favorite salads. 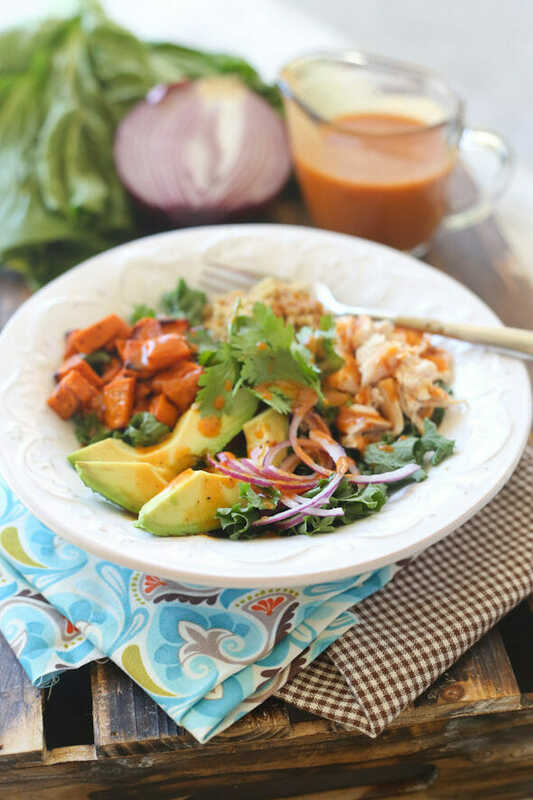 The combination of flavors and that dressing is so yummy. It started me on a whole smoke paprika and sweet potato kick. I made it again for dinner tonight. 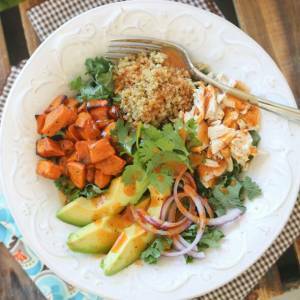 It’s such a flavorful, filling salad and I can’t get enough of it! Sometimes I’ll used a chicken sausage in lieu of the chicken breast. Thanks for a great recipe! The cooking directions for the roasted sweet potatoes disappeared! This was a go-to meal, but I can’t remember the temp and time to roast the sweet potatoes. Can you put it back in please?! ❮ Previous Post Previous post: Online Back to School Shopping!